Today, the London Transport Museum unveils a new permanent gallery in its space in Covent Garden, called “London by Design“. 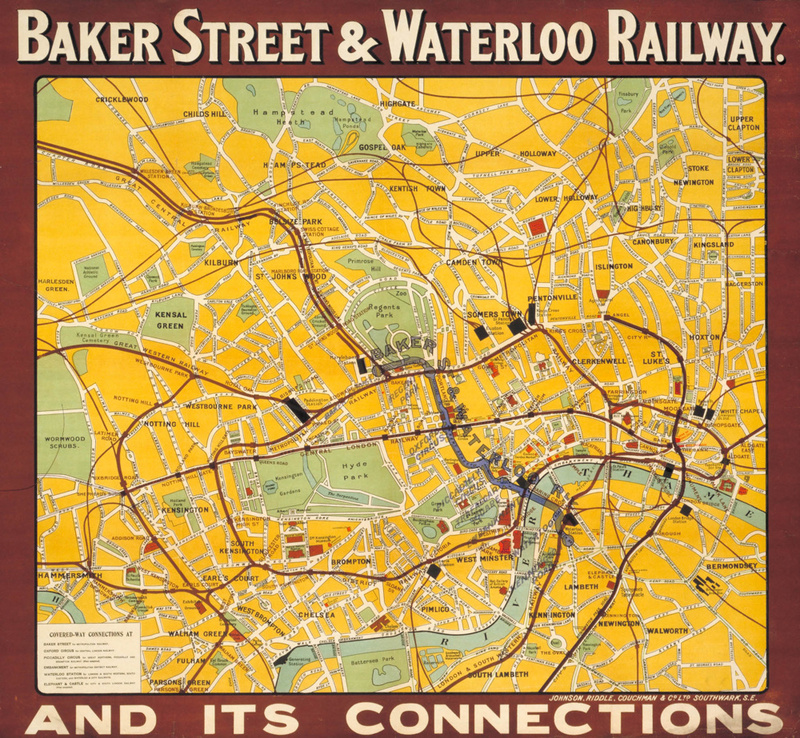 The gallery includes a number of maps which have not been exhibited before, including this lovely map of the “Baker Street & Waterloo Railway (of which the Bakerloo Line‘s name is a portmanteau) which first started running in 1906, between Baker Street and Waterloo. 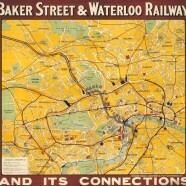 The map is a geographical one with the tube network added on to it (Beck’s non-geographic diagrams were still 25 years away) and it was likely intended to show just how useful the new link was, allowing access between north and south central London without having to go east to Farringdon or west to Kensington (operated presumably by rival train companies). 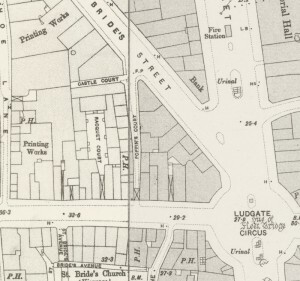 I like the cartography of this map – or, at least, of the underlying map by “Johnson, Riddle, Couchman & Co Ltd of Southwark. 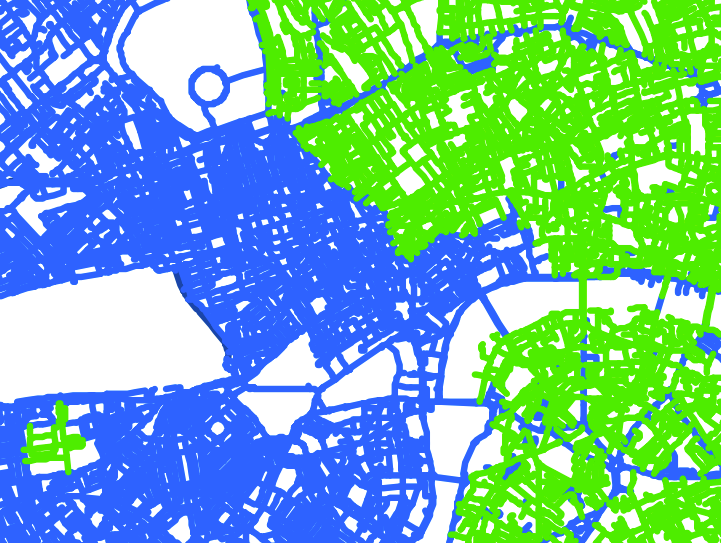 The colours are nice and simple – yellow urban areas, red key buildings, black stations and blue water features. London’s geography seems surprisingly familiar, 100+ years later. The parks and urban areas have generally not changed name. The railway networks themselves are perhaps what has changed significantly. I never knew for instance that Angel was once a terminus station. Bricklayers Arms station is one that has vanished completely off the network maps. Lots Road, the old power station that powered the tube network, appears on the map at the bottom. 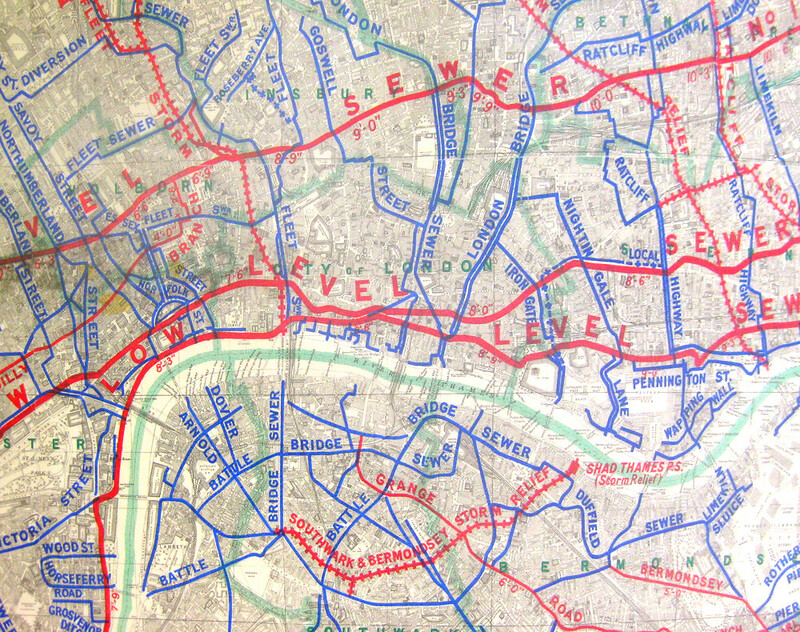 Of interest is how the Bakerloo route then added on top in a translucent manner, showing how closely it follows the road network above it, suggesting that it is the obvious alternative to a walk along Portland Place, Regent Street and Haymarket. 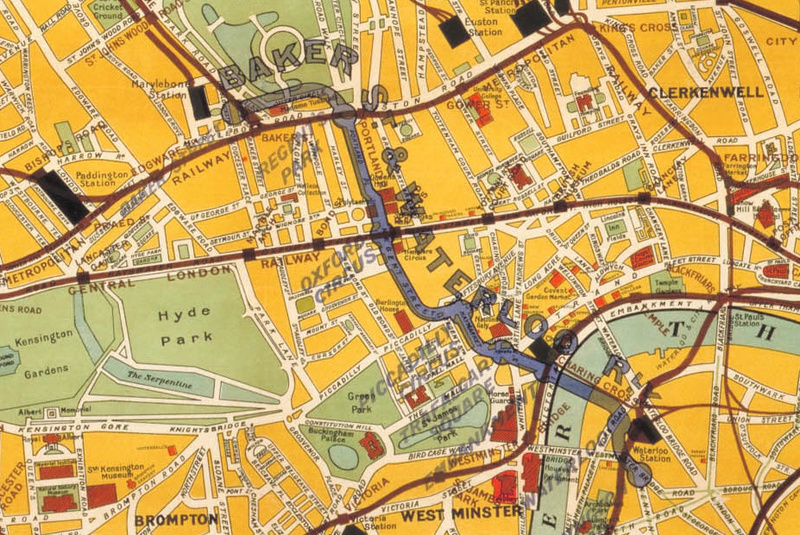 The original cartographers (not the Bakerloo ones!) have taken care to place their labels for areas, such that they don’t obscure road names. 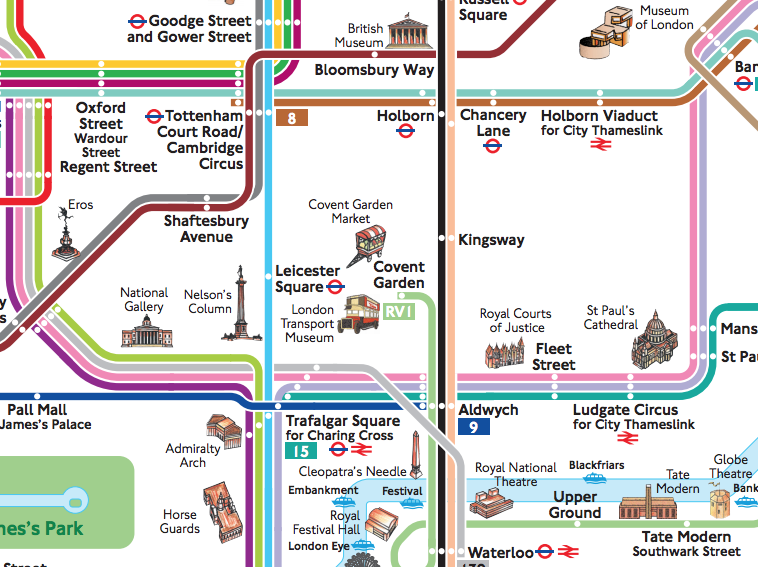 Unfortunately the railway lines that have been added on to the map at a later stage, as an overprint, take no such care – the Trafalgar Square station name in particular is a real mess! Still, it was doubtless an effective way of highlighting a brand new link to ease London’s ever-increasing congestion above ground. 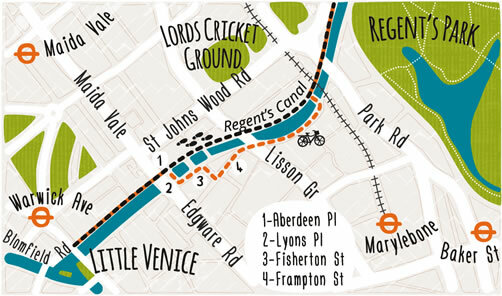 Thanks to the TfL press office for supplying the map image from the exhibition. I am off for dinner, via a trip on the Baker Street & Waterloo Railway.